Newport IW FC travelled away to Victoria Park in Bournemouth on Saturday 19th November to face The Poppies in the Sydenhams Wessex Premier Division. Bournemouth Poppies sat 13th with Newport 11th in the table prior to kick off. Only 3 points separated the sides. 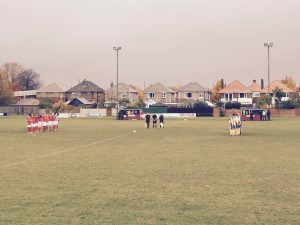 Both sides paid their respects with a minute silence to Andy Dine who sadly passed away in the week having been a former match official. Andy Sampson travelled with four reserve players with several first team players out through suspension and unavailability. Those missing from the travelling squad to Bournemouth were Aiden Sainsbury (suspension), Spike Pearce (injured/suspension), Keelan Walsh (suspension) and Liam Triggs (unavailable). Into the squad came Jack Turpinton, Caleb Charlesworth, 16 yr old Lewis Wright and Jimmi Burton. Both sides got off to a steady start early on with no threats from either team and that was generally the theme throughout the first half. It was on 36 mins when Sami Makhloufi struck for Bournemouth putting them 1 nil up and Newport now fighting for something out of the game in the poor weather conditions. The second half saw neither side showing real dominance and the heavy rain wasn’t helping the situation. Attempts on goal from The Poppies and The Port saw nothing challenging with shots off target or comfortably saved. On 65 mins Newport got a break through with young Jimmi Burton equalising to bring the game level. The Port were not looking to rack up another draw to their already tally of nine. It was 5 mins before full time when Joe Butcher struck from the right of the goal inside the 18yrd box which went through various Bournemouth players hitting the far left hand post and deflecting away from the goal. The game drew to an end with both sides picking up a point. Newport remained 11th in the league however Bournemouth dropped to 14th due to Amesbury Town picking up a 5:2 home victory over Horndean. Team: Streeter, Newbold, Turpinton, McDonough (c), Sampson, Powell, West, Kelly, Butcher, McInnes, Burton. Subs: Wright, Charlesworth. Newport will play host to defeated Horndean next Saturday (26th) at St Georges Park with The Port looking to secure their first home victory of the 2016/17 season.